1. 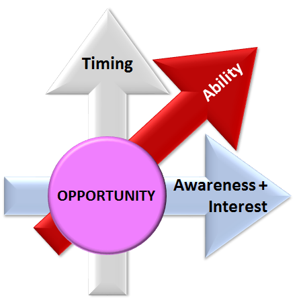 Awareness and Interest – There has to be an easily understood offering with a wide appeal. It has to have a name and be easily described. This is being done for you by the cable and phone companies. 2. Ability – There has to be a capacity to buy, cash, credit, or mortgage. Now, all of these systems have become increasingly affordable. 3. Timing – This is a big deal and it is the reason that classic mass marketing tools cannot work. The cost of being in front of the right prospect for the few appropriate times in their life is prohibitive. Think about it. We will all need a funeral home, but not very often, it will happen. In spite of that inevitability, funeral homes do not mass market. It doesn’t matter how clever or pretty the brochure or ingenious the website, nothing will bring business from someone who is not ready. The promotions would have to cause someone to build a home so you could become a potential customer. What are the chances of that. Those tools become productive when someone finds you through a searching activity in response to a highly targeted effort or referral. At that point when websites become a destination and printed materials reinforce a message, quality and relevant presentation design matter. This is not the type of support a marketing company that does not understand your business can provide between their other clients, the bakery and the antique stores.